Here’s part 2 in that series on cardiac kids – some basic principles for getting on with the actual anaesthetic. This post is by Andrew Weatherall (with a check over by Justin Skowno). A little while back I shared a post trying to cover some ideas on how to rapidly assess the kid with heart disease who presents for something else. Which is all very well but once you’ve assessed the kid with the personalized piping, they still need the operation. So let’s imagine that patient with the supracondylar fracture who needs their operation right now. No delays. No transfers.What can you do? Which agent? Which technique? How many different ways can it go wrong? You might remember a bunch of life lessons from The Simpsons. Babies can be relied upon to deliver justice to old tycoons. The coroner is tiresome after a while. Don’t eat the insanity peppers. Well that eight word phrase comes from Homer to Bart, purpose built for shifting the blame. But it turns out to be a pretty good phrase to remember for the “standard” heart kid needing your help. You can actually get most of the way there with a few simple thoughts placed in the back of your mind, somewhere behind the memory of trying chocolate for the first time so they are in a happy place. Good exercise tolerance probably means good anaesthetic tolerance. That one is just for some handy reassurance. They arrived with their targets in place. Assuming the patient is pretty well, they turned up with a blood pressure, heart rate and respiratory status that worked for them. So if they turned up breathing room air, they probably don’t necessarily need huge amounts of oxygen. If they turned up with saturations in the 80s and looking blue, don’t try to re-colour them pink (and remember there’s a few who will actually get a lot worse with lots of oxygen). Every one of them has communications until proven otherwise. Safety first says assume they can shunt. If they don’t you’re ahead already. Some of these patients (we’re talking particularly about the ones with low saturations) have a circulation that’s set up with a certain degree of balance. If the peripheral afterload goes up or pulmonary vascular resistance (PVR) drops, you’ll drive more blood through the lungs. Saturations might go up but systemic perfusion can drop at the same time. The reverse is also true – lower afterload or higher PVR means less flow through the lungs and your saturations drop though you might eject a little more blood out to the body. So the aim is to maintain carbon dioxide in the normal range, deliver the oxygen needed but not more and be ready to offset any effects of anaesthetic agents you’ll deploy (think especially about the vasodilation). Yeah. You want to aim for the middle of that road I guess. Fasting is not your friend. Actually it’s not really anyone’s friend in some ways. Keep the oral clear fluids going for as long as prudence allows and don’t be too timid about a little bit of IV fluid at induction (maybe starting with 10 mL/kg and then reassessing) to give adequate circulating volume. Your paediatric anaesthesia may generally involve the demonstration of superior bubble skills but those are probably the ones you blow at induction and not the ones in the IV lines. If any kid might have a shunt then any kid is at risk of an air bubble getting over to the arterial (& brain) side of the circulation. No bubbles. The guidelines have been adapted so it won’t apply to as many as in the past. That doesn’t mean you can forget it though. Patients with prior endocarditis, unrepaired cyanotic disease, recent repairs with prosthetics or repairs with residual defects all get the suggestion attached (with additional consideration of the surgery you’re doing of course). Patience isn’t just the lesser known name for Solitaire. Inhalational induction may take longer if there’s a shunt. IV induction should be a slower game because anything rapid is more likely to result in sudden changes in haemodynamics. So deep breaths despite the stress and take it slow. It is fair to say that premedication may help avoid distress at the start and at places I’ve worked premedication is common for heart surgery (but less so for other operations in heart kids). While propofol can be used there is no doubt it decreases peripheral vascular resistance and reduces mean arterial pressure so you would need to be particularly careful – so careful that maybe it’s just better avoided because there are better options. There are plenty of kids who have been put in serious trouble they didn’t need to be because propofol was the drug chosen. This is the one exception where it’s worth thinking if the drug you’re used to actually isn’t the one to reach for (hint: probably leave it in the vial). Sevoflurane and isoflurane are in common use and well described in the literature. It makes sense to avoid higher levels even during induction and be patient enough to allow it to take effect as in higher levels there are some direct myocardial effects. Including nitrous oxide in the mix is the obvious other way to minimise the reliance on these volatile agents. Using opioids liberally to decrease big swings in heart rate around airway manipulation and through surgery also makes sense. The commonest agent for this purpose in Antipodean spots is fentanyl. Though in experienced hands other agents can be used, fentanyl meets the “use what you know” criteria quite well. Regional anaesthesia also appears to be well tolerated if used judiciously. Unless of course you let the haemodynamics go screwy (in which case can I direct you back to point 1 above). The bottom line is that taking a pause to think through the principles at work gives you time to plan and a good plan generally stops you feeling stressed. The more you know from assessment the better things will go. To bring it back to the first post, are they better pink or better blue? OK as per usual the whole idea is that this might be just enough to get your interest to go and read some source material. Gottlieb EA, Andropoulos DB. Anesthesia for the patient with congenital heart disease presenting for noncardiac surgery. Curr Opin Anaesthesiol. 2013 Jun.;26(3):318–326. White MC, Peyton JM. Anaesthetic management of children with congenital heart disease for non-cardiac surgery. Continuing Education in Anaesthesia, Critical Care & Pain. 2012 Jan. 17;12(1):17–22. Wilson W, Taubert KA, Gewitz M, Lockhart PB, Baddour LM, Levison M, et al. Prevention of Infective Endocarditis: Guidelines From the American Heart Association: A Guideline From the American Heart Association Rheumatic Fever, Endocarditis, and Kawasaki Disease Committee, Council on Cardiovascular Disease in the Young, and the Council on Clinical Cardiology, Council on Cardiovascular Surgery and Anesthesia, and the Quality of Care and Outcomes Research Interdisciplinary Working Group. Circulation. 2007 Oct. 9;116(15):1736–1754. Williams GD, Jones TK, Hanson KA, Morray JP. The hemodynamic effects of propofol in children with congenital heart disease. Anesthesia & Analgesia. 1999 Dec. 27;89:1411–1416. Öklü E, Bulutcu F, Yalçin Y, Ozbek U, Cakali E, Bayindir O. Which Anesthetic Agent Alters the Hemodynamic Status During Pediatric Catheterization? Comparison of Propofol Versus Ketamine. J. Cardiothorac. Vasc. Anesth. 2003 Dec. 1;17(6):686–690. Williams GD, Philip BM, Chu LF, Boltz MG, Kamra K, Terwey H, et al. Ketamine Does Not Increase Pulmonary Vascular Resistance in Children with Pulmonary Hypertension Undergoing Sevoflurane Anesthesia and Spontaneous Ventilation. Anesthesia & Analgesia. 2007 Dec.;105(6):1578–1584. Rivenes SM, Lewin MB, Stayer SA, Bent ST, Schoenig HM, McKenzie ED, et al. Cardiovascular effects of sevoflurane, isoflurane, halothane, and fentanyl-midazolam in children with congenital heart disease: an echocardiographic study of myocardial contractility and hemodynamics. Anesthesiology. 2001 Feb.;94(2):223–229. Kachko L, Birk E, Simhi E, Tzeitlin E, Freud E, Katz J. Spinal anesthesia for noncardiac surgery in infants with congenital heart diseases. Pediatric Anesthesia. 2011 Dec. 28;22(7):647–653. Shenkman Z, Johnson VM, Zurakowski D, Arnon S, Sethna NF. Hemodynamic changes during spinal anesthesia in premature infants with congenital heart disease undergoing inguinal hernia correction. Pediatric Anesthesia. 2012 May 15;22(9):865–870. 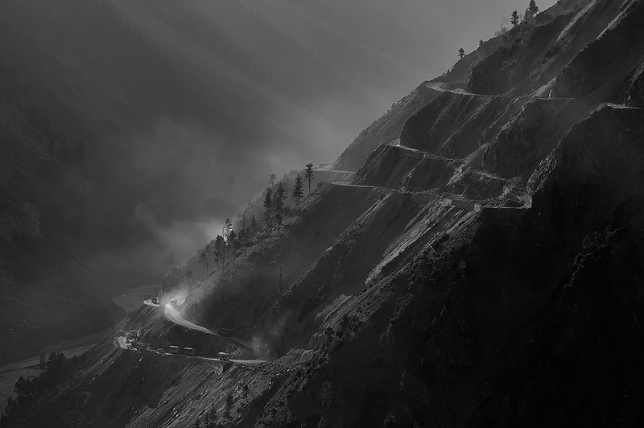 Oh, and the image of that slightly terrifying Indian road between Sonamarg and Kargil was posted to the flickr Creative Commons area by Zuki and is unaltered as it appears in this post (under CC 2.0). Figured it would be you. Hope you enjoyed the post.